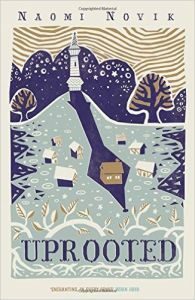 ‘Uprooted’ is a standalone fantasy novel based very loosely on ‘The Beauty And The Beast’ fairy tale. In this version, there is a valley in which there are several small villages and towns. There is also a forest which contains scary beings and is slowly trying to take over the villages and towns in the valley, so their only hope for survival is to give an 18 year-old girl to the person known as the Dragon every ten years. The Dragon returns the girls after their ten years but, as no-one knows what he does with them, they are considered spoiled and they mostly leave their homes to go to the city. This particular year there is one particular girl, Kasia, who has pretty much been brought up to know that she will go to the Dragon as she is the most beautiful in the villages. However, he picks her best friend Agnieszka who is the clumsiest and most untidy girl in the villages. We follow Agnieszka, who discovers her true destiny while living with the Dragon. I shan’t say more than that as it will spoil the book. I was really looking forward to reading this book from the amount of hype I had seen and the fact that it really sounded right up my street, however I found myself not enjoying as much as I had hoped. It took me quite a while to really get into this book and to understand what was going on. Maybe because it’s a standalone book the author just didn’t have enough time to give the reader a lot of background, so things happened that I often didn’t quite understand until later in the book, which took a bit of a leap of faith given this is an author I’ve not read before. 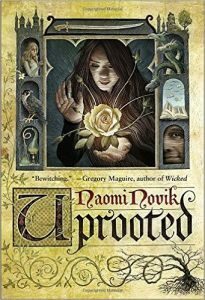 I also found that ‘Uprooted’ is a lot darker and scarier in parts than I expected it to be, not that that’s a bad thing, just something to be aware of. Having said all that, I didn’t hate the book, it just didn’t live up to my expectations which may be my fault for going into a book with expectations at all. I very much enjoyed the main protagonist, Agnieszka, watching her learn about her very special kind of magic and thoroughly annoying her teacher, the Dragon, in the process. Novik’s descriptions of the Dragon losing all patience are quite funny at times. I liked that, although Agnieszka is able to magically do things including creating beautiful princess dresses, she resolutely refuses this and deliberately learns to create simple dresses. To be fair, even if she does wear beautiful clothes, she will, at some point, manage to tear or spill something on them, something I can relate to! Agnieszka is such a strong character fighting for what she believes is right, even though it goes against highly powerful people. She often does make mistakes and this really makes her very believable as a character. She doesn’t follow the usual fantasy trope of a young person who suddenly discovers powers and is immediately able to control them and those around her. Novik writes a very different story to that, which I was grateful for. The character of Kasia is also one that I really enjoyed, even though I really wasn’t expecting to at the start of the book. She grows as a person after experiencing some truly terrifying things and becomes a strong and loving person who has Agnieszka’s back when things start to go wrong. Again, Novik has not done what I expected with Kasia, she hasn’t used her as simply a warrior, but gives her multiple dimensions which many authors might not have chosen to do. The writing in this book is very lyrical and not traditional in terms of a fantasy book. There are long passages describing the magic created by Agnieszka and the Dragon full of detail and then other parts of the book are glossed over quite quickly. Even the fight scenes in this book, though they are quite gruesome and bloody, are also highly lyrical and beautiful in their descriptions. This is a style that takes a while to get used to but I think I’d like to read more books by this author now that I’m used to the way that she writes. My favourite part of the whole book was the ending and that isn’t said in a sarcastic or detrimental way as in I couldn’t wait to get it finished. I felt that the last chapter or two are very reminiscent of Terry Pratchett, especially the books he wrote about the witches. I think this was because we were watching Agnieszka going about the villages nearby to her to try and help people with her magic while also trying to work on the forest around her, too. I really liked that feeling that there is no happily ever after, but you get on and do the best you can with what you have left.